This elegant white satin and tulle dress is made by L'Etoile, a leading manufacturer of flower girl and first communion dresses. 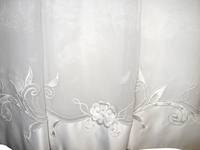 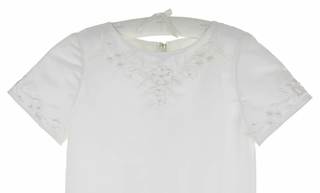 It features a white satin bodice with a simple round neckline and short sleeves, beautifully embroidered with flowers accented with beading and pearls. The bouffant tulle over white satin long skirt is made even more full with it's own attached crinoline and slip. 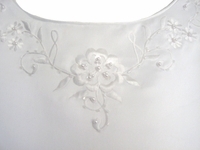 The dress has a back zippered closure and a stunning reverse scalloped satin hem embroidered with flowers trimmed with pearls and sequins. 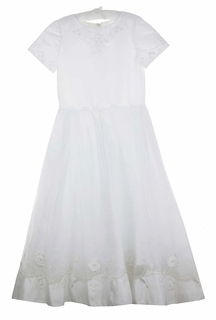 Perfect for first communions, flower girl dresses, wedding attire, portraits, and any formal occasion!